Also do you have any plans for the mount you made, I'm looking to make a new one. I didnt use any plans for my mount. I got my inspiration for it from the Probotix Dewalt mount which I still might buy. I have it and don't like it. The bracket is to shallow and seems to have some flex the top of the router hits the back plate when fully inserted. Hmm, good to know. Have you seen this one? I've got that one, using it with a 892, works great. FYI, it's $5 cheaper direct from K2CNC. Isn't that mount to large, the Dewalt is only 2.5" in diameter if I remember, that's over 3"
It's 2.715" Measured mine. I'll probably make something up in solidworks and make my own. I guess the K2 Bosh Colt Mount would work. Messing around with Microcarve. I am going to buy this app I think. I use MicroCarve V4 quite a bit, it is a great little program. No frills, good basic functionality. I have made some great lithophanes with it as well as Celtic carvings. What kind of bit sizes and shapes are you using with Microcarve? I just got some 1/16" bits, http://i.imgur.com/p4sUH.jpg , and they have been working the best so far. Are those fishtail bits? If so you can do even better with ball-nose bits with a stepover of 7-9% of the cutter width. I usually do a roughing pass with 1/8" ball nose and 15-20% stepover then a finishing pass with a 1/16" ball nose with a 7-10% step over. This works well generally but if you want to go super fine detail you can go to a small/narrow V carve bit with a 5-10% step over and the detail can amazing. 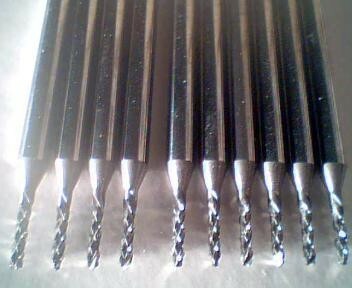 Just remember, the machining time with the v bit and narrow point, small stepover can be pretty long. Results are spectacular on lithophanes, you can do small lithophanes (2x3") with tremendous detail..... Most of my stuff is done with a 1/16" ball nose, sometimes a 1/32" ball nose. Material is typically corian.